Can Economic Growth Continue Forever? Of Course! Tim Harford, who writes the Financial Times‘s “Undercover Economist” column, has appeared on our blog many times. This guest post is part of a series adapted from his new book The Undercover Economist Strikes Back: How to Run or Ruin an Economy. Exponential growth is any kind of growth that compounds like interest payments. The classic example is the rice on the chessboard. According to an old story, the inventor of the game of chess was offered a reward by a delighted king. He requested a modest-sounding payment: one grain of rice on the first square of the chessboard, two on the second, four on the third, doubling each time. Yet this is actually a colossal amount—many times the annual rice production of the entire planet. The implication for economic growth seems obvious. 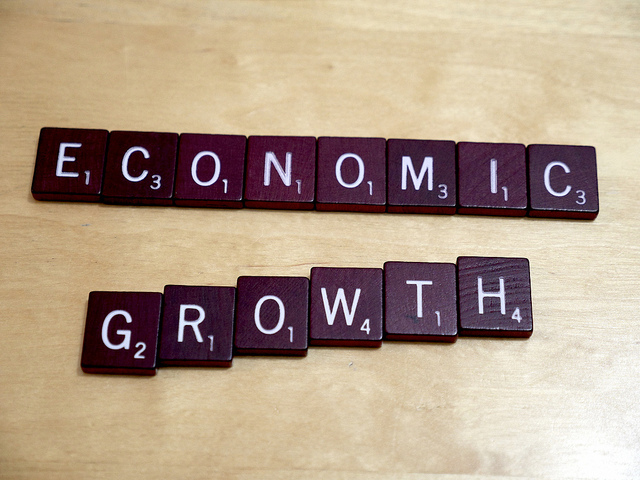 Our economy grows at a few percent a year. That hasn’t presented many insuperable problems so far. But growth of a few per cent a year is nevertheless exponential growth, and eventually—the physicists worry—we’ll reach a square on the economic chessboard that we just can’t fill. Economists understand this point perfectly well. One of the very first people to be called an economist was the Reverend Thomas Malthus, who died almost two hundred years ago. Malthus was worried about exponential population growth, and his math was incontrovertible. Fortunately, in the short term technological progress was faster than population growth. More recently population growth has been slowing down dramatically. There’s every reason to believe that the population of the planet is going to stabilize. I don’t think anybody believes zero population growth is unsustainable. You might well respond that even if population growth stops, growth in the economy – in GDP – will continue, and fall foul of the rice-on-the-chessboard problem. But I think that here we find a serious gap in the logic of the exponential doomsayers. They’re looking at exponential growth in physical processes—things like heating, cooling, lighting, movement. This is understandable, because they are, after all, physicists. Tom Murphy’s blog post is particularly startling on this point. He points out that if our energy consumption grows at 2.3 percent a year—less than historical rates but enough to increase energy consumption tenfold each century—then the entire planet will reach boiling point in just four centuries. It’s not the greenhouse effect at work; it’s irrelevant to Professor Murphy’s point whether the energy comes from fossil fuels, solar power or fairy dust. This is simply about the waste heat given off, inevitably, when we use energy to do useful work. And it’s pretty hard to argue with the laws of thermodynamics. The calculation sounds shocking, but it’s just the rice on the chessboard all over again. Here’s the logic lapse: energy growth is not the same as economic growth. GDP merely measures what people are willing to pay for, which is not necessarily connected to the use of energy, or any other physical resource. True, since the beginning of the industrial revolution the two have tended to go hand in hand, but there’s no logical reason why that tendency needs to continue. Indeed, it appears to have stopped already. Would you like to take a guess at energy growth per person in the United States over the last quarter of a century? It’s not just less than 2.3 percent. It’s less than zero. The same is true for other developed economies such as Germany, Japan and the United Kingdom. Now this is partly due to offshoring to China – but the offshoring effect just doesn’t seem big enough to explain what is going on. It’s also about the changing nature of what is bought and sold in a modern economy. Think of New York City. It’s a high-income place, and has for more than a century been a creative powerhouse: publishing, music, fashion, art, finance, software, you name it. But energy consumption per person in New York City is lower than in the United States as a whole—in fact, it’s lower than the average in any American state. Ultimately, we can do a lot of the things we value—including value in the grubby pecuniary sense of “are willing to pay lots of cash for”—without expending vast amounts of energy. It’s easy to grasp why exponential economic growth is not the same as exponential energy growth. If I’m worried about money, I may turn off my heating and wear a coat and hat indoors; a bit of extra money will mean I take off the hat and coat and use more energy. But that doesn’t mean that if I win the lottery I will celebrate by boiling myself alive. I fully agree with the environmentalists who worry that we cannot continue consuming more and more water, spewing out more and more carbon dioxide and burning more and more coal. The problem comes if we then leap to the conclusion that the economy itself cannot keep growing. Thankfully, that just doesn’t follow. Reprinted from The Undercover Economist Strikes Back: How to Run or Ruin an Economy by Tim Harford, published by Riverhead Books. While greens have no problem with the idea that growth can continue just because people get smarter and more efficient, Harford falls into the same logical fallacy he accuses others of. In the last two hundred years, economic growth HAS been the same as energy growth: the most spectacular increase in material wealth correlates almost exactly with the most spectacular increase in energy use because of the exponential increase in productivity you can achieve with fossil fuels compared to muscle, wind and water power. And there is just simply no substitute for the increases in productivity that fossil fuels have brought. To believe that economic growth is not ipso facto coupled to energy growth (which is not logically impossible, just completely lacking in evidence) is to believe by implication that increases in energy efficiency can always outrun declining stocks of fossil fuels. It is the belief in perpetual efficiency savings being found commensurate with those produced for a very limited period by fossil fuels that greens criticise, NOT the very simplistic notion that exponential growth exists in nature. Wealth is not physical consumption and we are already beginning to see a decoupling of it as described in the article. Things now include things that aren't really things but data and are just as good as and we will pay money for. Economic growth is based on increase actions and movements of money in an economy and the subjective worth of that economy. Money is an illusion, it can expand as long as there are spaces for zero on the screen. Theoretically you could have more money than particular that existed in the universe, you just need to add more 0s. But what is the purpose of that growth and what does it signify? If people still have a finite amount of time to live their lives, etc, what is the merit of continued (and infinite) economic growth? this is not a new observation, the writings of R.Buckminster Fuller abound with this logic even from his earliest books. The problem is not economic growth, but, as observed here, there is the malthusian logical flaw of equating 'wealth' with 'consumption' ('wealth' is measured in the number of 'energy slaves' available for the "livingry", the antithesis of 'weaponry', as applied to the maximum number of humanity at the minimum resource cost). Bucky called the process ephemerialization, the making of ever more leverage from ever less resource. Double the length of a ship, you get 8 times the cargo for only 4 times the fuel. And then there are the quantum leaps due to innovation: Malthus made a serious error in failing to predict refrigeration. but there is still hope: a report out of MIT this week looked at the economics of networks and concluded that the middlemen only survive when the network is sparcely connected, when the avenues to connect livingry to humanity can be gated and channelled; as the Internet increasingly connects individuals routing around the middlemen, a new economy emerges based on a meritocracy, an economy where the innovators can be directly rewarded by their clients restoring that missing 90% economic drain. A question that ought to be asked, though, is how does economic growth continue when we run out of more stuff that people (sensible ones, anyway) are willing to pay for? (As for example, I live quite comfortably while spending about $25K per year, even though I make a good bit more). We already have a large segment of the economy, the advertising industry, devoted to persuading people to buy far more than they reasonably can use. When closets and garages are sutffed with things bought and used once, what then?
" Yet this is actually a colossal amount—many times the annual rice production of the entire planet." Per Wikipedia, we [as a planet] grow about 700 million tons of rice per year. Figuring 22,000 grains of rice per pound, that is 3.1x10^16 -- that would get you to the 55th square. As a non-economist but regular reader of this blog, this is something I've always been curious about. In a world with finite resources, what does infinite economic growth even signify? Why would that ever be desirable? On another level the same goes for corporate growth. I don't understand the compulsion of corporations to be The Biggest One with The Most Money, when ultimately they're playing a zero sum game (re: resources, not necessarily dollars or whatever) and taking resources from other people. I think that the scientist's fallacy is that they forget what the economy is. They think that it's just this blob of goo that keeps growing and growing. It's really very non-linear and is always evolving. In fact, when it improves, and solves its own problems, it has technically "grown." No computer in the world will ever be too small to calculate a growing number on an Excel sheet, but that doesn't mean that what we use and consume has to grow. A hundred years ago, you were doing well when you could acquire more and more things, but then all of the sudden everything went on the computer, then everything went online. In both cases the economy exploded, but the size of our foot print shrunk. As we move more things from real space into the cloud, the economy will grow, and our physical presence will shrink. Hi Voice of Reason. The real fallacy, I think, is that no on really understands physics, and no one really understands economics. I'd wager, though, that most economists would agree with that statement, and most physicists would not. A basic understanding of urbanism - how humans arrange themselves on the landscape - is useful here. While increased energy use appears to have gone hand in hand with 20thC economic growth, we also sprawled horribly in that time. Spaced out towers/bungalows/warehouses connected by freeways replaced rowhouses framing streets and squares as the standard village/town/city development pattern. Fortunately the story of the 21st Century will be the rediscovery of traditional urbanism, of how we arranged ourselves on the land - arrangements discovered through thousands of years of trial and error - prior to 1950, following the realisation that that arrangement (coupled with modern sanitation, street surfacing materials and mass electric transit) reflects innate evolved human psychological preferences like sociability, refuge and prospect, freedom of choice etc. Energy use does not ineluctably correlate with economic growth, and often it doesn't even correlate well with quality of life. A little walkable car-free neighborhood of thin streets, durable buildings that share walls and capture sunlight consumes far less energy than an area the same size in NYC or San Jose. On the contrary, assuming that population growth & related problems can be controlled, the 21st century will mark the beginning of the post-urban era. Humans in general don't want to live in cities: they gathered into cities because communication was limited to the speed of foot or horse, so they had to live in close proximity. As faster transport - rail and then automobile - became available, those who could afford the new technology began the process of sprawl. Now that communication makes it increasingly possible to do many jobs from anywhere on the planet, what use are cities? Recently I watch the display of Donald Trump's obnoxious wealth on the Smithsonian "Mighty Planes" Episode: Trump 757. I hope the future comes quickly. The same Jean-Luc Picard with a wealthy collection of artifacts. How very old fashioned and materialistic of him. What, then, must ultimately increase for an economy to display real growth? If there is no inherent link to anything physical, what is value and/or what is wealth? The correct argument should be that unending exponential growth in itself in any system is unsustainable. That's all we know from science. So why should exponential economic growth be any different than other observed examples of exponential growth? The "boil the Earth" example sounds weirdly familiar. In 2006 I was working for a company that created software to design computer chips. We often had academic researchers give presentations on advances in semiconductor design. One presenter began by showing the historic growth of power consumption of a typical CPU used in desktops, laptops, etc. One way of expressing power consumption in semiconductors is in watts per square centimeter. He claimed that if historic rates continued, by 2014 the power consumption of a CPU would, in watts per square centimeter, exceed that produced by a nuclear reactor. He then went on to describe various techniques he was researching to reduce power consumption while continuing to increase computing capacity. At least some of these techniques must have been put into practice by now, which may be why your latest iPad doesn't burn your house down.